SOUTH BEND, INDIANA – As a workforce development professional in north-central Indiana, I have some insights that could prove vital for folks age 50 and older who are in a job search – and these tips, some savvy and others prudent, come straight from the EMPLOYER’s mouth. Taken to heart with a sprig of proper preparation, these guidelines just might help provide you with a jolt of labor-market competitiveness enough to secure employment. Remember the 5-p scenario: proper preparation prevents poor performance. ). Region 2 features some 23,500 employers, 302,000 workers, and 611,000 residents. WorkOne’s mission: We exist to get people jobs as quickly as possible at the highest possible wage by meeting the needs of regional employers! Did you notice that WorkOne serves TWO types of clients: 1) individuals (from age 16, in fact, until someone retires regardless of age) and 2) employers? We have a dedicated “Business Services Division” where WorkOne staffers concentrate their efforts on building professional relationships with employers, delving into what types of skills and abilities they need in workers, and then doing their utmost to link regional employers with job candidates whose skills fit nicely with what a company needs. Workforce development professionals, moreover, focus much energy on TWO types of employment abilities: 1) technical attributes, and, importantly, 2) soft-skills. Briefly, here are examples, among others, of technical skills that can be important to employers:  math abilities;  writing skills; and  deftness in using the Internet, computers and software. In today’s blog, though, I’d like to focus on soft skills. A person’s awareness and practice of soft skills is a central need of employers regardless of their industry; in other words, as an employer, whether you operate a hotel in South Bend (St. Joseph County) or an advanced-manufacturing facility producing orthopedic-medical devices in Warsaw, IN (Kosciusko County), you absolutely need employees to recognize soft skills and put them into practice every day at the work-place. A big reason soft skills are so important to employers is because workers’ understanding and using them spurs overall efficiency and productivity in a workplace. You may be wondering how a discussion of soft skills could lead to a boost in competitiveness for 50-somethings who are seeking employment. Among several reasons for such a boost is one that forms a central theme to this article: soft skills, in many instances, are life-skills. For instance, here’s a partial list of soft skills valued by employers when reviewing job applicants:  punctuality;  reliability;  honesty;  interpersonal communication skills;  expressing a positive attitude and enthusiasm;  problem solving;  respect for other people;  fairness;  working as part of a team;  professionalism;  self–leadership and –discipline;  adaptability; and  learning and curiosity. Now, let’s consider how to elevate your competitiveness in a labor market: We begin with a presumption that you might be quite strong in certain soft skills but not even realize your own strength. That’s where a workforce development professional comes in; and don’t fret if you’re reading from somewhere outside Indiana. Every congressional district in the United States has agencies similar to WorkOne because workforce-development funding flows primarily via federal dollars distributed by the U.S. Department of Labor. In addition, WorkOne has numerous legal obligations and duties under the federal Workforce Innovation and Opportunity Act (WIOA), and this statute likewise applies to all similar agencies nationwide. So wherever you reside in the United States, there is a publicly funded agency to help you with employment. Also, here is a COLOSSAL NOTE TO EVERYONE – YOU DO NOT HAVE TO BE UNEMPLOYED to seek and receive help from your local workforce-development agency. Residency is the key requirement. So, this brings us back to soft skills: A local workforce-development professional will help you under-stand where you’re strong in the mix of soft-skills and where you’re not. This is an important juncture be-cause at WorkOne we’ve learned that self-analysis and –motivation, in sync with empathetic guidance of a development professional who’s aware of what employers need in workers, are critically important to securing employment. During such counseling sessions, most people will gain understanding concerning soft skills of where his or her weaknesses reside — and, in a fashion similar to WorkOne Northern Indiana, your local development agency should have training sessions and events geared toward strengthening specific soft skills. Stronger skills will come if you apply yourself and prepare properly. Onward and Upward! 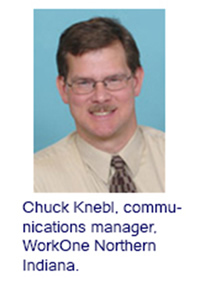 If you have questions or comments, please eMail me at: CKnebl@GoToWorkOne.com. I was completely intrigued when I heard the term ‘soft skills’ in this article. I don’t think I’ve ever heard the attributes listed above as soft skills…but it does make sense. I am curious, as to how exactly you determine someone’s strengths in certain soft skills. Is there a test/exam that you give in order to determine a person’s specific strengths or is it based off of observations? I’m really quite intrigued by this and would love to learn more. Thank you! Skills can be learned. People are finally learning that hiring for fit within the culture is more important. Also, still being alive after 50 often confers maturity.